Physoderma leaf spot. Credit: Alison Robertson. A plant pathologist at Iowa State University is studying an emergent corn disease capable of reducing the yields of affected crops to near zero. Virtually unseen in the United States for decades, Physoderma has reared its ugly head in Iowa cornfields with increasing regularity in recent years, said Alison Robertson, an associate professor of plant pathology and microbiology. The disease, caused by the fungus Physoderma maydis, first appeared in India in 1910 and turned up in the United States in 1911. In the 1930s, the disease hit hard in southeastern states, leading to yield losses of 5 to 10 percent in the region. But U.S. farmers switched to seed varieties that were less susceptible to Physoderma, and the disease virtually disappeared until 2007, when Robertson began seeing brown spot symptoms. Stalk rot symptoms appeared in 2013. 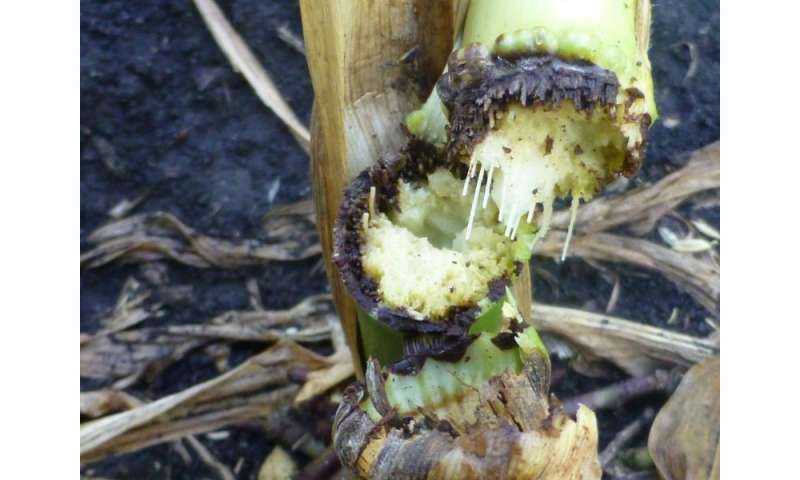 This year, the disease has popped up in dozens of fields throughout Iowa, Robertson said. Physoderma infects the entire corn plant but shows two different forms of symptoms, she said. The most noticeable is called Physoderma brown spot, which leaves distinctive discolorations on the leaves of the corn plant. The other, known as Physoderma stalk rot, is more difficult to detect because it affects the lowest nodes of the stalk. Physoderma stalk rot. Credit: Alison Robertson. "The stalk rot usually doesn't show leaf symptoms," Robertson said. "It looks like a beautiful plant, and you don't notice it until the plant falls over and breaks." That breakage could occur during high winds or a rainstorm or it could occur during harvest, she said. Many of the infected plants won't yield any crop at all. Plants with severe brown spot may not form ears, and, with stalk rot, fallen plants may not be picked up by a combine. So why has the disease reappeared? Robertson explained that three factors must be present for any disease to take hold: a susceptible host, a pathogen and the right environmental conditions for the pathogen to flourish. For a long time, at least one of those factors was usually absent. But the wet springs the last few years have provided sufficient environmental conditions for the disease to take hold, Robertson said. Physoderma needs significant moisture early in a corn plant's development to successfully infect the plant, she said. "Excessive rain during the early vegetative growth of the crop is a major part of the equation that's been in place the last couple years," she said "If we had a dry spring, we wouldn't get the disease." Robertson said little research has explored ways to combat Physoderma, and there's little farmers can do this year if they've discovered it in their fields. 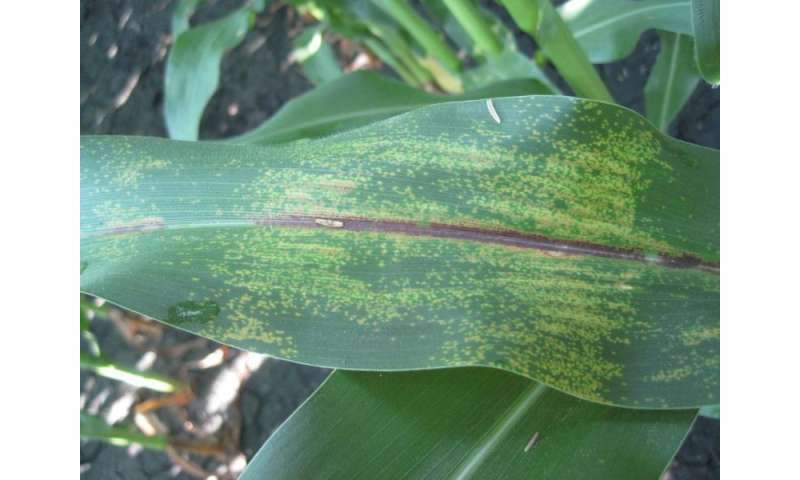 The sporangia that give rise to the disease can survive for three to seven years in a field, so she recommended that farmers rotate corn out of an infected field in following years. Changing seed varieties to a less susceptible hybrid can also help, she said. Robertson is conducting trials to learn more about Physoderma, which could lead to a better understanding of how to fight off the disease. "Right now, we don't really know when or how to apply fungicides or how other management techniques might affect the disease," she said. "I'm hoping we can fill in some of those knowledge gaps."